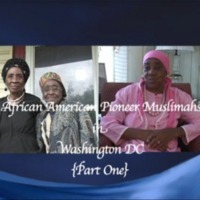 This documentary film uses oral history to examine the lives of African-American Muslim women in Washington, DC primarily during the 1940's and 50's. The narrators discuss the Muslim faith, black history in the United States, the transition from traditional southern protestant Christianity to Islam, the teachings of Elijah Muhammad, the Muslim Girls' Training and General Civility Classes, and aspects of the Nation of Islam unique to Washington, DC. The film was produced by Zarinah Shakir as part of a series for "Perspectives of Interfaith Television." Humanities Council use rights as outlined in grant agreement. ,” DC Digital Museum, accessed April 22, 2019, https://wdchumanities.org/dcdm/items/show/1536.